Posted on April 30, 2013 by Mr. H Posted in Hero's Guide	. 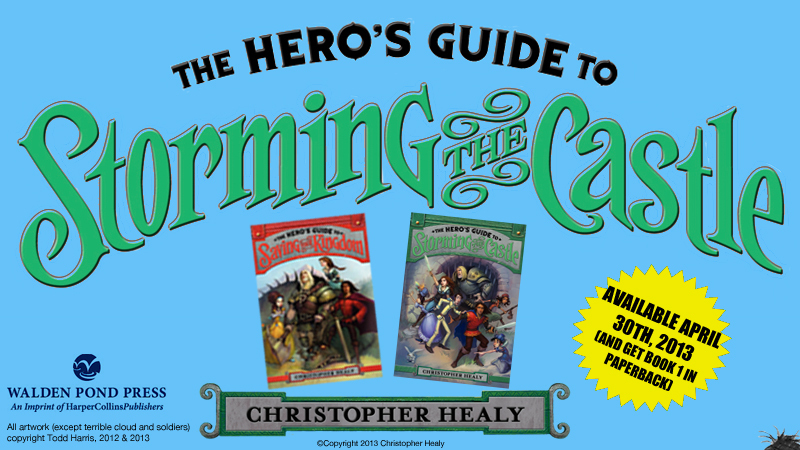 The Hero’s Guide to Storming the Castle is officially available as of today! And don’t forget to check out the paperback version of Book 1: The Hero’s Guide to Saving Your Kingdom, also out today, featuring exclusive paperback extras, like Todd Harris’s deleted sketches, my essay titled, “Why Are Fairy Tale Heroes So Dumb?”, and The Hero’s Guide to Lists. Storming the Castle has Girl Power! Posted on April 29, 2013 by Mr. H Posted in Blog Tour, Hero's Guide	. 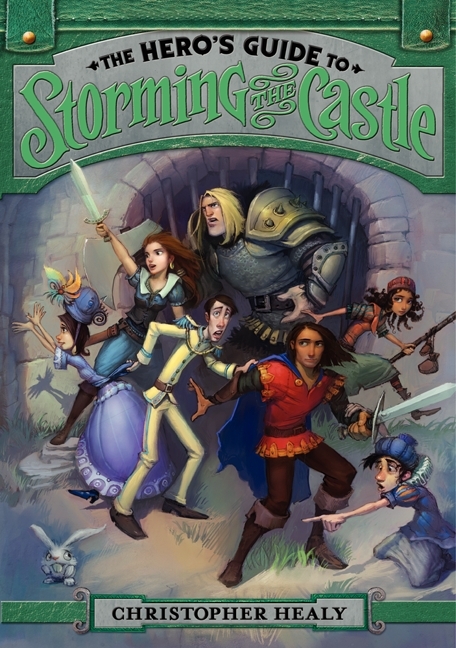 The wonderful blog, Teach Mentor Texts, is celebrating the release of The Hero’s Guide to Storming the Castle all week as the centerpiece of their Girl Power extravaganza. You can check out this guest post I wrote for them about the importance of strong female characters in children’s literature. And then check back with Mentor Texts every day this week for a spotlight profile on a different Hero’s Guide princess. I’m utterly thrilled to be part of a Girl Power-focused celebration like this. The Hero’s Guide books may focus on a team of four princes as their lead protagonists, but having strong female characters in my books in incredibly important to me. Check out the post to see what I mean. And thanks again to Jen and Kellee at Mentor Texts for giving me this opportunity. Countdown to Storming the Castle Continues! Posted on April 8, 2013 by Mr. H Posted in Blog Tour, Hero's Guide	. The countdown to Storming the Castle continues! Here is a full list of all participating blogs and the dates of their art reveals. Check ’em all out for as many sneak peeks as you want. Countdown to Storming the Castle! Posted on April 3, 2013 by Mr. H Posted in Blog Tour, Hero's Guide	. Starting Thursday, April 4th, a new excerpt and illustration will be featured on a different blog every day. Well, nearly every day. It’s all part of the countdown to the the April 30th publication of The Hero’s Guide to Storming the Castle. Check out the “Goings-On” page of this site for a full schedule of sites involved in this very special blog tour. And coming in May, it’s Blog Tour II! Spanning more than 20 blogs, The Hero’s Guide Heroes Guide will roll out a new character bio every day! Well, nearly every day. Find out secret (and not-so-secret) info about all your favorite Hero’s Guide characters—and many of your non-favorites, too! Watch here for details. And follow me on Twitter to stay up to date on blog tour info. My contribution to this year’s Fairy Tale Fortnight extravaganza is a fun Q&A that’s up today on the fabulous blog, A Backwards Story. Plus, you can enter for a chance to win signed copies! Click the link and check it out! Posted on April 1, 2013 by Mr. H Posted in Hero's Guide	. Da-da-da-DAH! The official book trailer for The Hero’s Guide to Storming the Castle is here! Written, produced, directed, and starring yours truly, this book trailer represent a full three days of blood, sweat, and tears. Watch it here on YouTube. I hope you enjoy the next one minute and thirty-five seconds. Oh, and feel free to repost it, link to it, or otherwise share it.